[UPDATED JANUARY 10]. 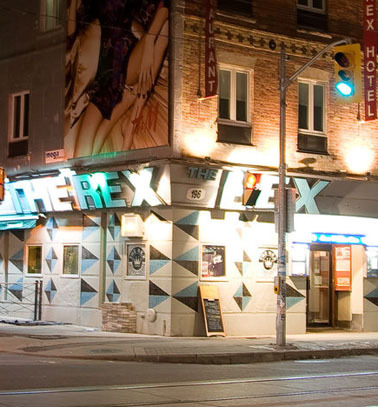 What are some options for dropping by the Rex Jazz & Blues bar in Toronto in the first month of this perhaps fateful year 2018? Which of the scheduled groups would you most like to hear? Those asking these poignant questions also promised that if we did go to any of these shows, they’d listen to the music when it was playing — and not try to talk about Donald Trump or Justin Trudeau or whatever over the jazz (and blues etc). I should say as well that I am an amateur saxophone player (well “semi-professional,” my piano-playing brother used to say), and saxophone players are usually who I like listening to myself. Similarly, while I’ve been listening to jazz & blues in the Toronto area and beyond for many years now, I wouldn’t pretend to any vast expertise in covering the scene. This is just a list of what appeals most to me subjectively, with virtually no objective pretense. 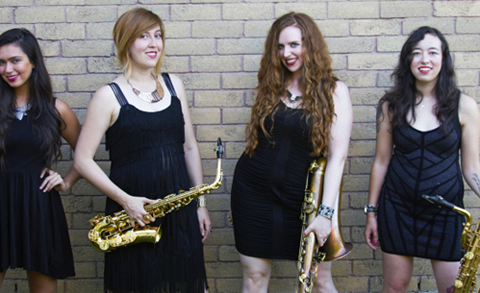 The Dialectica Saxophone Quartet is not playing at the Rex in January 2018, but Chelsea McBride (far right) brings her Socialist Night School big band to the Rex stage January 15. In any case, as a more or less completely non-political way of welcoming the new year (in any direct or partisan sense) — and hoping there will be some entertaining moments along the way — here are my personal lucky seven options at the fabled (and much-valued) Rex in Canada’s current largest metropolis, for January 2018. (1) WED 3 JAN : NEW YORK’S BILL TODD … Bill Todd- Sax, Harry Grasser- Piano, Israel’s Alon Near- Bass, Carmen Intorre- Drums. This first show takes place today as I write, and it may still be too cold for some especially older listeners (like me) to make their way to the corner of Queen and St. Patrick streets on public transportation. But Bill Todd’s Twitter site reads “Bill Todd … @BillToddMusic … #jazz trained. Saxophone, Flute, Clarinet. Buffalo boy turned Brooklyn Man. Praying for the Sabres.” Any hard-working young man like this from Buffalo deserves support in Toronto. And if you can’t make it at the Rex today (or January 3, 2018 if you’re reading this much later), you can at least see and hear Bill Todd play Monk’s “Ask Me Now” on the marvelous You Tube in our time. (2) MON 15 JAN : CHELSEA MCBRIDE’S SOCIALIST NIGHT SCHOOL … 15 pc Jazz Orchestra Led by Saxophonist/ Composer Chelsea McBride. Not everyone likes jazz orchestras of this size (hangovers of the old big bands of the 1930s and 1940s). But Toronto (and Canada at large) has a long history of cultivating such musical enterprises. 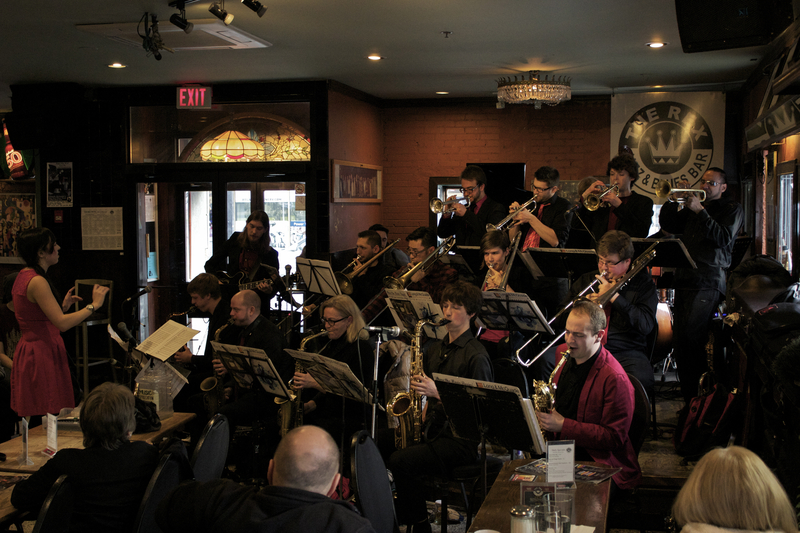 Chelsea McBride’s Socialist Night School big band at the Rex, November 6, 2017. The orchestra’s 2017 “debut full-length album ‘The Twilight Fall’ … most recently received 4 stars in Downbeat Magazine. Bandleader Chelsea McBride’s compositions are influenced by the lineage of Bob Brookmeyer, Maria Schneider and Darcy James Argue.” For a taste on You Tube before Mon 15 Jan try THIS or THIS. 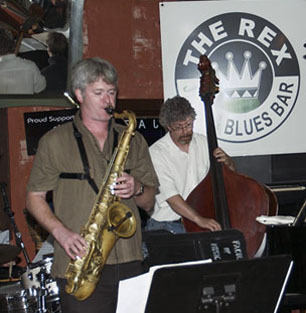 (3) WED 17 JAN : VAUGHAN MISENER … Kelly Jefferson – Sax, Geoff Young- Guitar, Vaughan Misener- Bass, Kevin Dempsey- Drums. I chose this because I’m a great admirer of the tenor saxophone playing of Kelly Jefferson. But there is also an excellent much-more-than-just-a-rhythm section playing with him here. Leyland Gordon Group at the Rex, December 27, 2013. 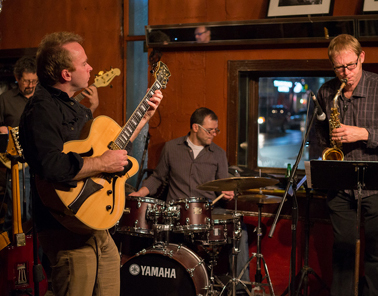 Left to right : Victor Bateman, bass ; Leyland Gordon, guitar ; Mark Kelso, drums ; Richard Underhill, alto sax. Photo by Jeremy Tudor Price. URGENT UPDATE JANUARY 10 : We’ve just been informed that the Leyland Gordon Group — one of Dominic Berry’s all-time favourite Toronto jazz organizations — will be performing on Friday, January 19, 2018. Though the group has often appeared at the Rex, this time (also back by popular demand) it will be at The Richmond Rogue Kitchen + Bar, 284 Richmond St E, Toronto — on the north side of Richmond St E just west of Sherbourne. The music will start around 8 PM. The atmosphere at The Richmond Rogue Kitchen + Bar is welcoming and the food worthwhile. For a taste of the music beforehand try “Leyland Gordon Quintet ‘Harvest Hills’ Live at The Flying Beaver” and/or “Leyland Gordon – SUSpense, Live at The Rex Jazz Bar.” Meanwhile, Mr. Berry is making definite plans to take in this one event for dead certain (unless it is just too appallingly cold for the streetcars to work!). 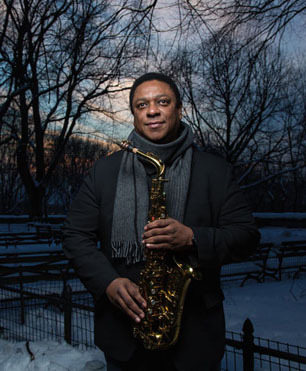 (4) THU 18 JAN : NYC’S VINCENT HERRING W/DEREK GRAY QUINTET … Vincent Herring – Sax, Pat LaBarbera – Sax, Chris Pruden – Piano, Soren Nussen – Bass, Derek Gray – Drums. Check out the Discography (As Leader/As Sideman) on “Vincent Herring … From Wikipedia, the free encyclopedia” for the impressive career of this now mid-50s alto saxophone virtuoso, who was born in Kentucky and raised in California. Another especially interesting feature of Thu 18 Jan at the Rex is that the group performing with the visiting Vincent Herring includes the local tenor sax legend and Humber College professor (if that’s quite the right term) Pat LaBarbera. Originally from upstate/western New York, his brilliant mature career has been in Toronto and he actually has an entry in the Canadian Encyclopedia. 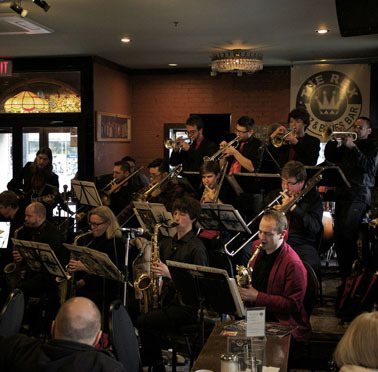 You can also hear him on You Tube — playing “You and the Night and the Music” at Andy’s in Chicago in 2011, and Coltrane’s “Mr PC” with students from the Nepean All-City Jazz Band in Ottawa in 2016. 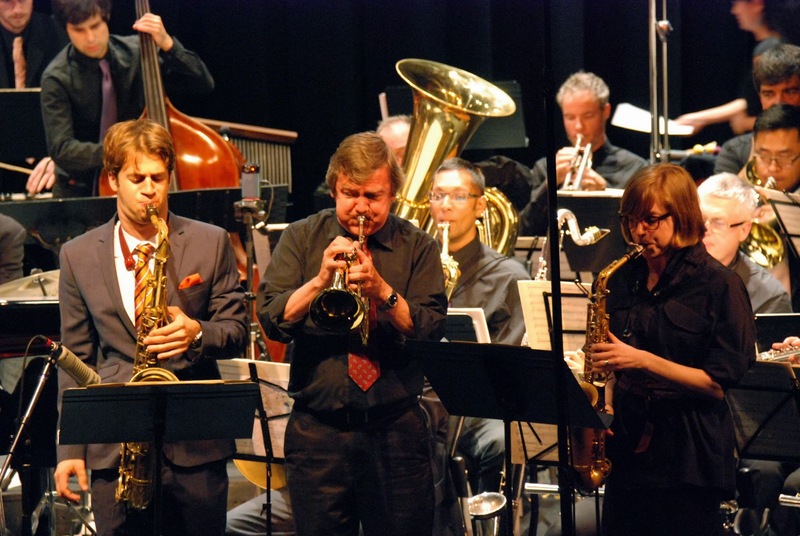 Mike Malone on trumpet (centre) with the orchestra, 2013. 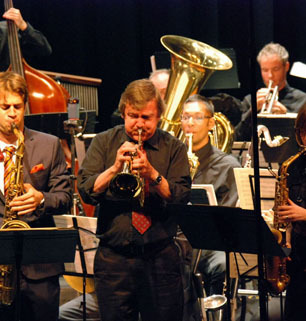 (5) MON 22 JAN : MIKE MALONE & THE WRITERS JAZZ ORCHESTRA … 18-Piece Big Band led by Trumpeter Mike Malone. 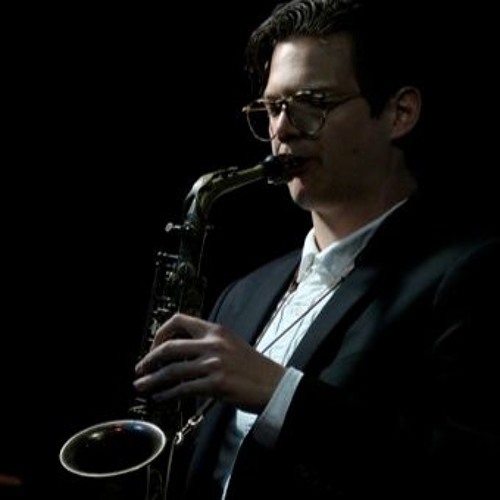 (6) WED 24 JAN : ZACH SMITH’S URBANIA OCTET … 8-Piece Mini Big Band ft. Patrick Smith – Sax … Led by Zach Smith- Trombone. I know absolutely nothing about this group. But something about the minimalist write-up on the Rex site makes me want to hear them. 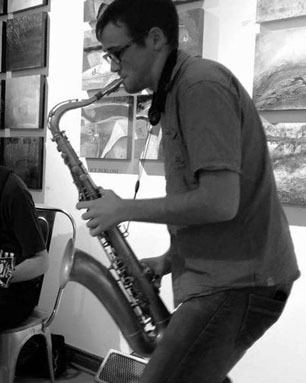 Tenor sax player Patrick Smith in action. Mike Murley at the Rex, back in the early fall of 2004.